After hearing about Belmont Brewing Company‘s celebrating their 25th anniversary, marking them as Southern California’s oldest brewpub, I knew I had to visit, especially since they’re one of the few breweries in Long Beach. Nestled amongst other shops by the Belmont Veterans Memorial Pier, it has a nice area outside, where one can walk by the Pacific Ocean. So, I recently went and one thing that proved difficult was finding street parking, of which there are only several spots nearby. Fortunately, I was able to find a spot a couple of streets away. 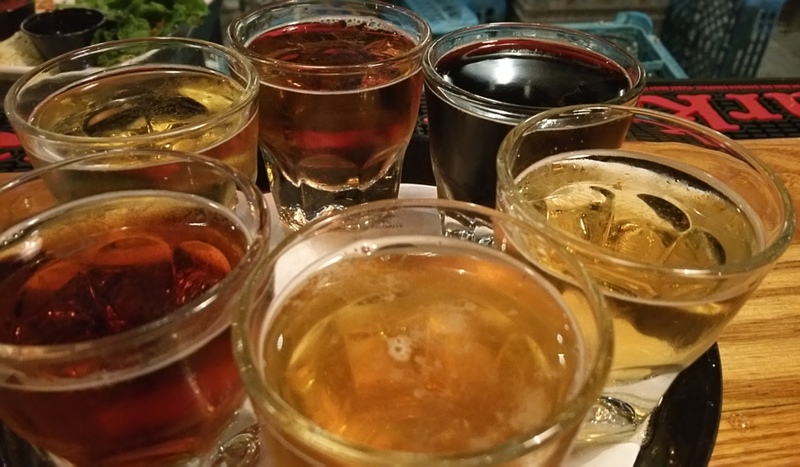 I then seated myself at the bar and, as is my typical move at a brewery, I ordered a flight of beers. 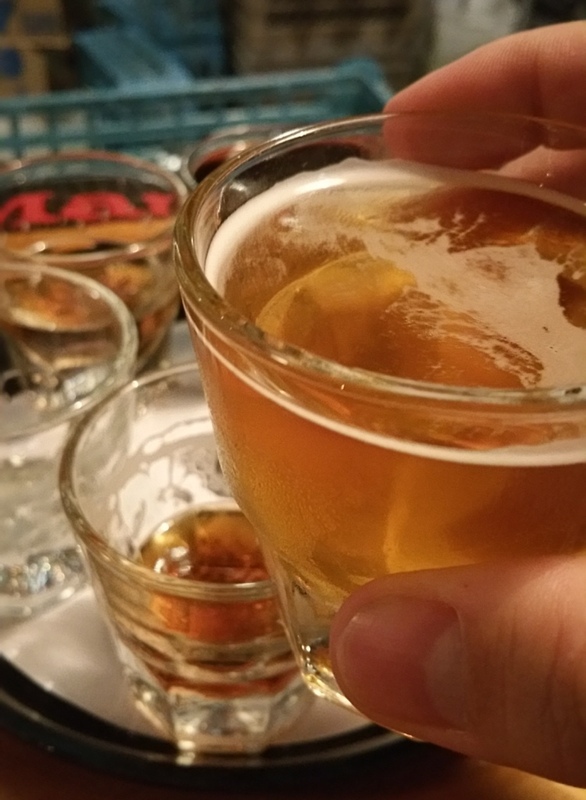 Belmont Brewing Company’s flight of six beers goes for $6.50 and are in short glasses arranged on the perimeter of a circular platter. In a clever move of convenience, underneath each taster glass is the name of each beer as well as a brief description. I definitely thought that was a smart move, so that both customers don’t have to keep asking the bartenders what each beer is and so that the bartenders don’t have to keep answering that question. five main beers, made on site by brewer David Blackwell. He can regularly be seen behind the bar, managing four large fermenters and mash/lauter tun kettles on display there. BBC’s selection includes the most popular Strawberry Blonde (light fruit forward blonde ale) as well as Marathon (light blonde ale, with mild hop and bitterness), Pale Ale (classic California pale ale with centennial and northern brewer hops, served unfiltered), Top Sail (amber ale with malty medium hop bitterness), Long Beach Crude (strong, black stout with complex chocolate malt flavor) and a rotating ale of the month, in addition to various blends. I started off with Marathon (4.5% ABV), a light ale, which seemed decent for a light ale, although it was not my particular preference. Next up, I had their Strawberry Blonde (4.5% ABV), which was pleasant after having had the Marathon. I thought the strawberry taste was noticeable, but not too strong. It has a light fruitiness, which is enjoyable. Next up, normally would be their Pale Ale, but, since they were out of it, they gave me Topathon instead, which is a mix of Marathon and Top Sail. I was not a fan. I did not like the combination of a light, fruity ale with an amber ale. I couldn’t drink much of it. So, I then moved on to the Top Sail (5.5% ABV), their amber ale. Since I’m not typically an amber ale fan, I am not sure what to say about this ale, aside from me not particularly enjoying it. I then had their stout, Long Beach Crude (6.5% ABV), which was dark and noticeably chocolatey. It seemed heavy (and filling) and dark – fitting for a stout, although a bit much for my palate. Finally, they serve a seasonal ale, which, for my visit, was their #1495 IPA (7% ABV). I found this IPA to be decent (and I think I detected Citra hops (which I enjoy)), with almost a bit of a creamy mouthfeel, rather than a tougher mouthfeel, which made it more easily drinkable. I’m not going to say that this IPA was great, but it was easily more drinkable than half of the beers on the taster flight. I ended up enjoying the #1495 IPA and the Strawberry Blonde the best that evening – for me to like a strawberry blonde beer is not easy, so I think that is a compliment to their brewing on that beer. I wish the best to Belmont Brewing Company in their 25th celebration and I hope it goes well for them. * Ashleigh Ruhl, “Belmont Brewing Co. Turns 25”, Grunion Gazette (18 June 2015), 14A.